The Grandparent Project is a creative way for me to piece together memories and photos and share them with my mother and siblings in California and my children in the Midwest. 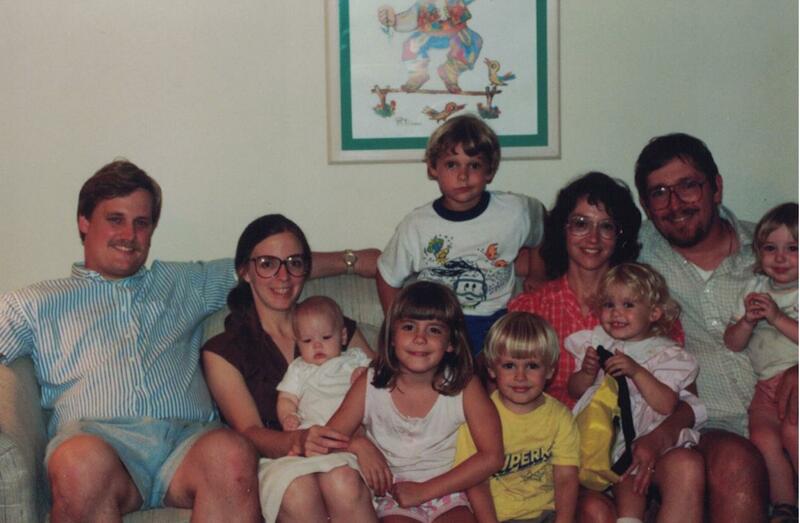 It’s also a Cousins project, and here’s a photo that my sister just sent of the cousins in 1989. The last post ended with a picture of me in January of 1991, very pregnant with Grandbaby #5 and my fourth child. I just found another couple of photos taken at the end of 1990 that I want to include because GranneLouise and Godfather Michael celebrated their New Year’s Eve birthdays at our house. So that brings us to 1991, a very important and eventful year in our family. On February 27, we welcomed Emily Clare into the world. GranneLouise again came down from the Bay Area to Pomona to care for the three older kids while I was in the hospital and recovering at home. I cannot tell you how immensely grateful I am to have a mom who has always been cheerful, helpful, comforting, capable, willing, and available when I have called her for help. And this was a year that I really needed her, as you will see. 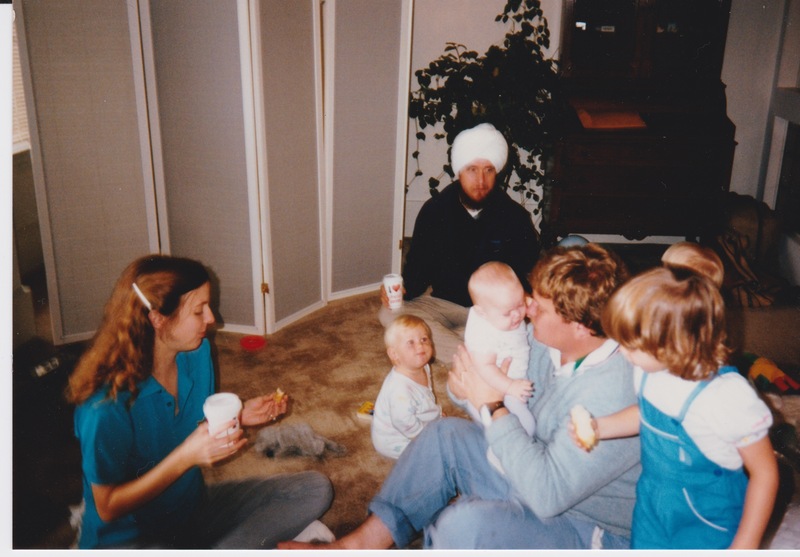 By this time, our family of six had outgrown our little house of 1,050 square feet, and were looking for a place where we could afford to live in greater comfort and send our children to decent schools. Jim requested a job transfer, and he was offered one to either Huston, TX or Schaumburg, IL. Having spent my childhood in another suburb of Chicago, I voted to return to the Midwest. It was a hard decision to live so far away from the rest of my family. I was eager to spend as much time with them as we could before the big move. The next visit was from Aunt Sarah, who brought Emily a beautiful crocheted sweater and booties that she had made. The booties eventually became Emily’s first Christmas ornament, and she still has them. The Grandfamily also came down in April to celebrate Rebecca & Joshua’s birthdays (which are only 8 days apart). In early May, we spent a weekend house-hunting in the northwest suburbs of Chicago, taking baby Emily with us. (* who was babysitting the others?) We found our new home and signed the papers. Also that month, we celebrated Emily’s baptism. I think it was some time around my late sister Alice’s birthday, May 19. We visited Los Gatos for Grandpa’s birthday July 10 and did a sort of farewell tour of the area, including another Cousins’ Day in San Francisco. And naturally, we paid a special visit to the St. Luke’s Episcopal Church Columbarium where my sister Alice is buried. Now, my husband and Grandpa George are buried there as well. We were all set for closing on the house and moving day, when Emily fell ill with spinal meningitis on July 25. I called my parents in a state of complete panic and sorrow. Her condition was dire. “I’ll send you the best help I can,” said Dad. “I’ll send GranneLouise.” Emily spent ten days in the hospital, fighting the Hemophilus Influenza type B bacteria against which she had already had two of three vaccinations. I spent the first couple of days with her overnight, praying mightily and pumping breast milk to store for her recovery while she lay in the metal crib, connected to IV tubes. Jim would come the next few days after work and stay the night while I went home to the others. During the day, he was frantically rearranging our move. 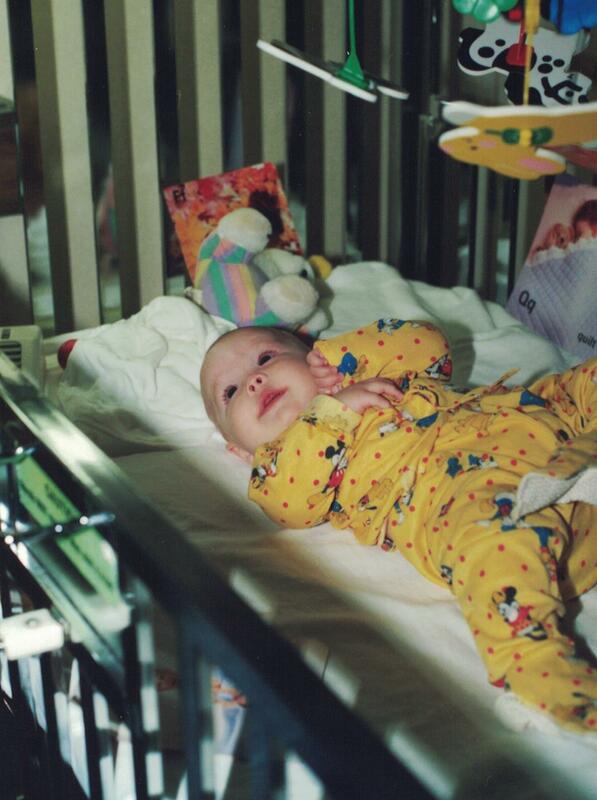 Eventually, Emily became herself again and charmed the nurses with her beautiful smiles and huge eyes. Our entire community was relieved when she was pronounced cured, with no residual brain damage or hearing loss. Her “homecoming” was a very happy occasion, celebrated with our priest and his family and my mom, who took this picture: And we flew off to Schaumburg, spending a week in an Embassy Suites hotel until we took possession of our new home on August 14. This is one of those episodes that is now almost “a merciful blur” (as my mother would say) in my mind. I’m hoping that other members of the family will share their version of the story to help me fill in the gaps or correct the errors. 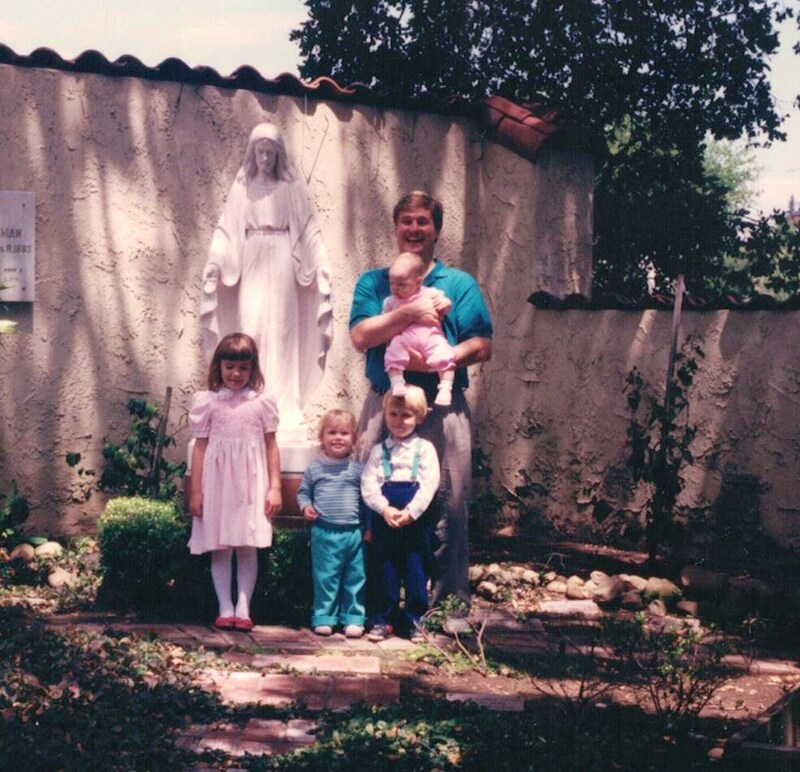 This entry was posted in Family and tagged family, family memories, grandparent project, grandparenting. Bookmark the permalink. I remember that John was very taken by the pictures of me with Emily, which started discussions that eventually led to Grandchild #7. I remember your request for the photoshoot, too, because you were hoping for just such a result! You came down alone on that trip, right? Was there another reason for your travel? I was going to a museum conference as I remember. Ah. I thought it was something like that. Fifty years before we lived there it was all orange groves and agriculture. Then it just became part of the LA urban sprawl. Thanks for listening to the story!